Dr. Rafik Abu Samra received his Doctor of Medicine Diploma in 1993 from the University of Silesia Katowice, Poland followed by General Surgery Specialization Exam, Poland 1998 & Cardiac Surgery Specialization Exam, Poland 2003. Dr. Rafik Abu Samra was awarded a Ph.D. degree in cardiac surgery (minimally Invasive Cardiac surgery including Robotic assisted surgeries), Poland, 2011. Dr. Rafik Abu Samra worked in Medical University of Silesia, Katowice, Poland as a cardiac surgeon for 8 years, and as a consultant cardiac surgeon for the next 9 years. 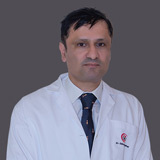 He worked briefly for a year in American Heart of Poland, Bielsko, Poland and then 4 years as a Senior Consultant Cardiac Surgeon and Head of the Department of Cardiac Surgery at Al Qassimi hospital, MOH, Sharjah, UAE. Dr. Rafik Abu Samra established and introduced the first unit of Robotic-Assisted Cardiac Surgery (using Da Vinci system) in the United Arab Emirates. Dr. Rafik is a member of the Polish Society of Cardio-Thoracic Surgeons, member of the European Association for Cardiothoracic Surgery & member of International Society for Minimally Invasive Cardiothoracic Surgery. 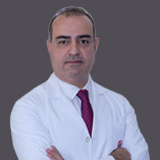 Dr. Rafiks area of expertise also include minimally invasive saphenous vein harvesting, all types of valvular surgery including AVR, MVR and mitral valve repair and surgical care to patients with thoracic aortic disease both in the urgent (acute dissection) and elective setting (chronic aortic aneurysms). Dr. Rafik Abu Samra performed minimally invasive procedures Endoscopic Atraumatic Coronary Artery By-pass (EACAB), EACAB procedures with thoracoscopic Left Internal Thorasic Artery (LITA) harvesting and the assistance of AESOP robot. In 2003, Dr. Rafik underwent a training in collaboration with Medical University in Leipzig,on total robotic revascularization and performed 13 coronary artery bypass procedures with the use of ZEUS Robot. In 2004, Dr. Rafik Abu Samra was invited by the Memorial Hospital in Istanbul, where he organized a workshop in minimally invasive surgery and performed 6 EACAB procedures with teaching sessions. Dr. Rafik has 4 publications and 11 presentations in Polish and English. Languages: Arabic, Polish, English and Latin (Basic).